Sometimes it's so easy to make my family happy. For example with an unexpected and beautiful dessert. A few sheets of puff pastry and enough apple slices to cover the bottom of a baking dish. Apricot jam to be brushed onto the tart while it's still hot. That's it. (Although I have to admit that a leftover of sirupy mirabelle liqueur in my fridge came perfectly well to marinate the apple slices. ) If you don't have mirabelle liqueur lemon juice will be equally fine. While the puff pastry thaws, peel, quarter and finely slice the apples. Marinate the apples with liqueur or lemon juice. Roll out the thawed sheets of puff pastry. Put one of them aside to later form the covering grid. Butter the baking dish and cover the bottom with the remaining puff pastry. 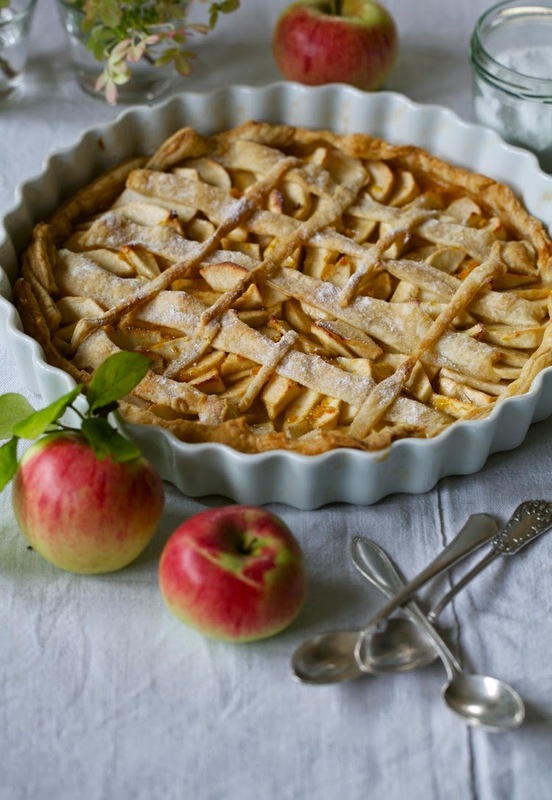 Spread the apple slices evenly onto the pastry dough and finally cover with the pastry grid. Bake for 20 minutes at 180°C or until the pastry dough turns golden. Out of the oven, brush the tart generously with apricot jam. Before serving, sprinkle the tart with icing sugar.